Walnut, almond, pine nut, cashew: they've all made their way into your favorite summer spread. Next time you're overloaded with basil, go nuts and blend it with shredded coconut and lime for a tangy spin on pesto. A beautiful bunch of basil is more alluring to me than an actual bouquet. When the leaves are bright and unblemished and their intoxicating aroma wafts through the air, you're left powerless: that basil is going home with you. Delicious as it may be wedged between thick slices of summer tomato and mozzarella, basil often begs to be pulverized into pesto. This Coconut-Lime Vegan Pesto takes basil on a tropical vacation. Get into an off-duty mindset and let this pesto do its thing in the refrigerator overnight for maximum flavor - it'll be worth waiting for. 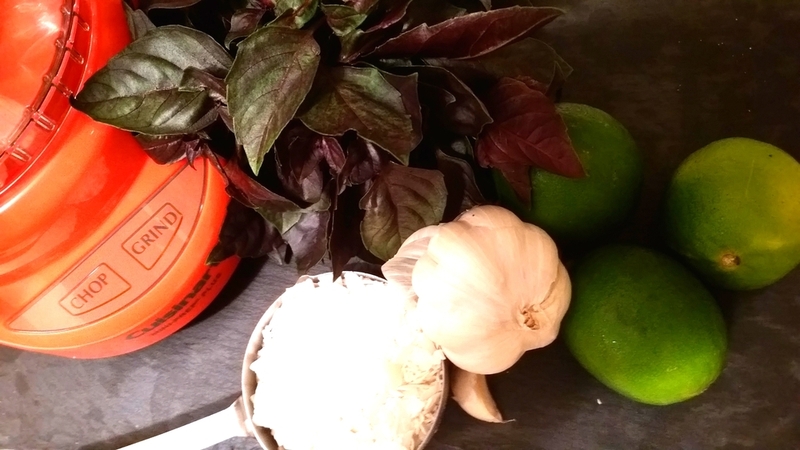 Expect an earthy-hued end result when utilizing the slightly sweeter purple basil seen here (I believe this is the dark opal variety), and use it how you see fit - as a dip, sandwich filling, or combined with a whole grain. I'll be thinning this out and mixing it with red quinoa...if I don't eat it all with a spoon first. Combine coconut, pistachios, lime juice and zest, garlic and basil in food processor and pulse until well-combined. Add olive oil and salt; process again. Place in refrigerator overnight. Thin with water if desired before using. *On sale NOW at Williams-Sonoma! The orange is sold out (sorry!) but this is a steal of deal. Get yours here!